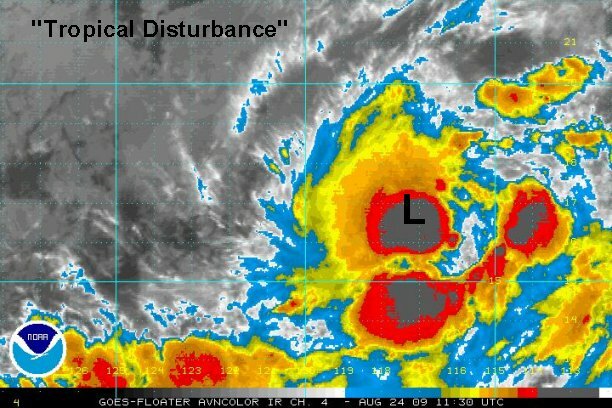 A new tropical depression has formed? It looks like tropical depression 12-e has formed and is on the verge on becoming tropical storm Ignacio. 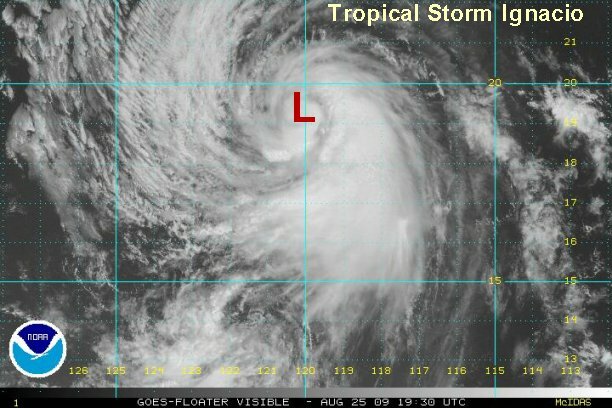 We believe that NHC will classify this tropical depression at 8 am pdt. As of 8:00 am edt / 5:00 am pdt the tropical disturbance is centered near 16.8° N / 117.3° or about 850 miles west southwest of Manzanillo, Mexico. Top sustained winds are estimated at 35 mph. It is moving west at about 17 mph. After fighting some northerly wind shear, it looks like the low level circulation is now under the deep convection. 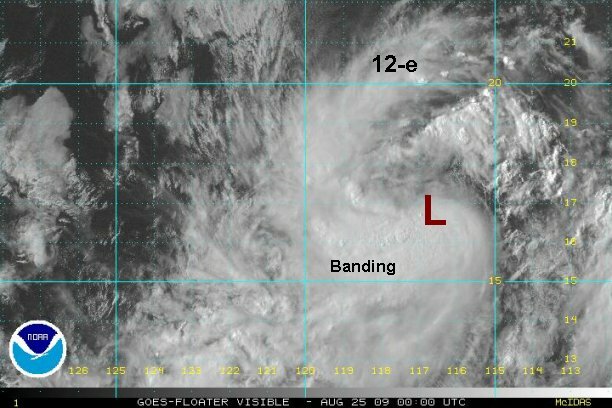 Banding in now taking shape on the southern side of the system. With this being the case, we think that there is enough organization to classify this system as a minimal tropical storm. As of 8:00 pm edt / 5:00 pm pdt tropical depression 12-e was centered near 16.8° N / 117.3° or about 595 miles southwest of Cabo San Lucas, Mexico. We estimate top sustained winds of 40 mph. It is moving northwest at about 12 mph. 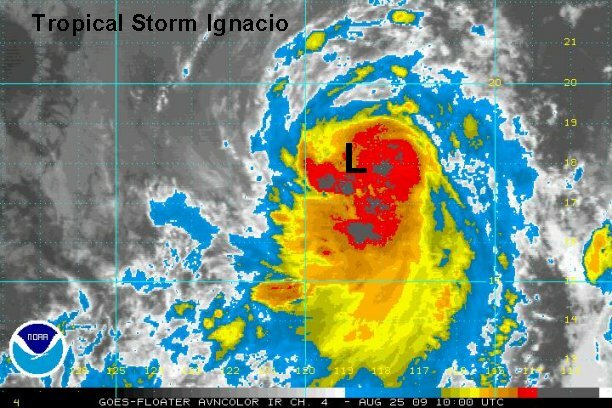 Tropical storm Ignaico had a very deep burst of convection a few hours ago. At that time winds may have gusted to 50-55 mph. The convection has decreased some at this time. Ignacio is on a track toward colder water which will limit its potential for strengthening. As of 7:00 am edt / 4:00 am pdt tropical storm Ignacio was centered near 18.2° N / 119.2° or about 675 miles southwest of Cabo San Lucas, Mexico. We estimate top sustained winds of 45 mph (NHC estimates 40 mph). Ignacio is moving northwest at about 12 mph. Ignacio is moving steadily toward cooler water which will take away potential for strengthening. 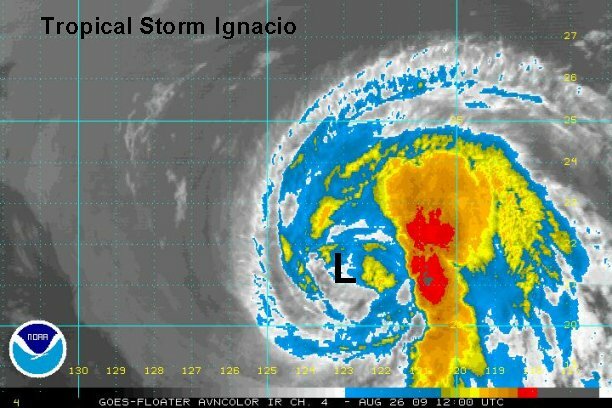 As of 5:00 pm edt / 2:00 pm pdt tropical storm Ignacio was centered near 19.4° N / 120.3° or about 710 miles west southwest of Cabo San Lucas, Mexico. We estimate top sustained winds of 50 mph (NHC estimates 50 mph). Ignacio is moving northwest at about 12 mph. Ignacio will gradually weaken as it moves gradually toward cooler water. As for now, there is an impressive plume of moisture on the eastern side of the circulation with heavy rain and storms. As of 8:00 am edt / 5:00 am pdt tropical storm Ignacio was centered near 21.3° N / 122.7° or about 820 miles west of Cabo San Lucas, Mexico. We estimate top sustained winds of 50 mph (NHC estimates 50 mph). Ignacio is moving northwest at about 14 mph. Ignacio is moving over cooler waters and is being sheared. The center of circulation has no convection associated with it any longer. It will drop down to tropical depression strength tonight as weakening continues. As of 5:00 pm edt / 2:00 pm pdt tropical storm Ignacio was centered near 22.1° N / 124.5° or about 935 miles west of Cabo San Lucas, Mexico. We estimate top sustained winds of 40 mph (NHC estimates 45 mph). Ignacio is moving northwest at about 12 mph. This will be out last update on Ignacio.